The Naval Academy is organized much like a civilian college. The Board of Visitors, similar to a college board of trustees, provides the collective views and recommendations of the Board to the Superintendent concerning the Naval Academy. 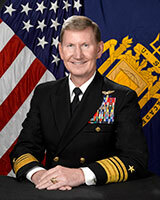 The Academy's Superintendent, a Navy admiral , is the equivalent of a college president. He oversees all of the school's functions. The Superintendent's principal deputies include a civilian Academic Dean, who oversees the academic program and the faculty, and the Commandant of Midshipmen, who serves as dean of students and supervisor of all military and professional training. The Superintendent, Commandant, Academic Dean and academic division directors sit on the academic board, which sets the academy's academic standards. 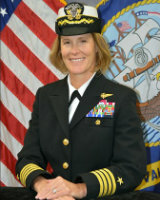 The principal military advisor to the Superintendent on all matters pertaining to the daily operation, administration, and maintenance of the U.S. Naval Academy, including advice on academic programs, faculty and staff; admissions, athletics, budget, diversity, and institutional research, and on matters pertaining to maintenance, repairs and improvements of 50+ facilities (many designated as national historic landmarks); athletic fields, boat basin, cemetery and columbarium.